To save the private carrier, India’s premier may have to choose between relaxing foreign ownership rules for Abu Dhabi’s Etihad and letting state banks take a hit. Both options touch the sorest points of Indian finance: it’s an awkward dilemma in the run-up to a general election. 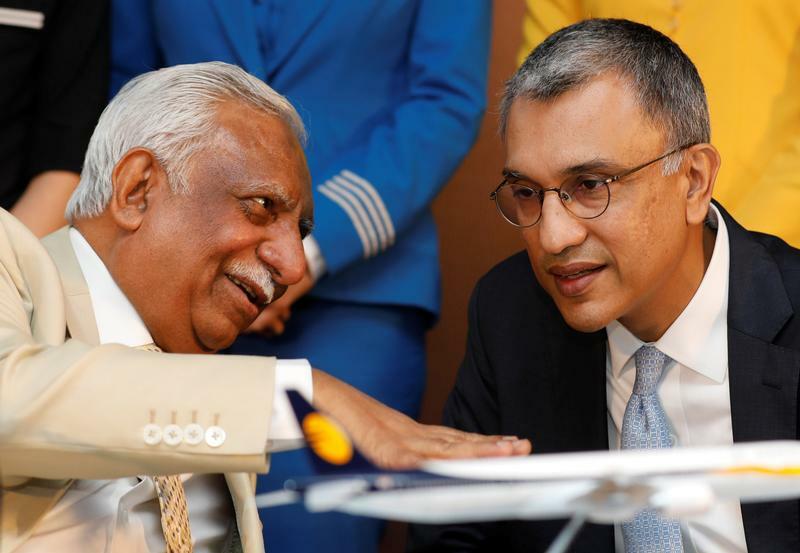 Naresh Goyal, Chairman of Jet Airways speaks to Vinay Dube, CEO of Jet Airways during a news conference in Mumbai, India, November 29, 2017. India’s Jet Airways said on Jan. 16 that it was working on a turnaround plan with its stakeholders and considering “various options on the debt-equity mix”, raising the prospect that its lenders could take a stake in the airline. Speculation has been mounting that the carrier will receive a bailout from its investor, Abu Dhabi carrier Etihad, after Jet missed a bank repayment earlier in the month. Etihad owns 24 percent of Jet Airways; foreign carriers are permitted to own up to 49 percent of Indian airlines. Etihad has sought exemptions from India’s securities regulator from making a mandatory takeover offer, the Economic Times reported, citing a letter dated Jan. 15 addressed to the State Bank of India, the country's largest lender. "Without this approval we are not willing to invest a single penny further," Etihad’s Chief Executive Tony Douglas stated bluntly in the letter, ET added. India's civil aviation secretary, R N Choubey, told reporters on the sidelines of a conference in Mumbai on Jan. 16 that control of Jet would need to remain in domestic hands. Jet shares fell 8 percent on Jan. 16, putting its value at about 30.6 billion rupees ($431 million).